To start, open the Document Properties dialog by selecting File > Properties from the menu. Click on the Security tab and choose Password Security from the dropdown. 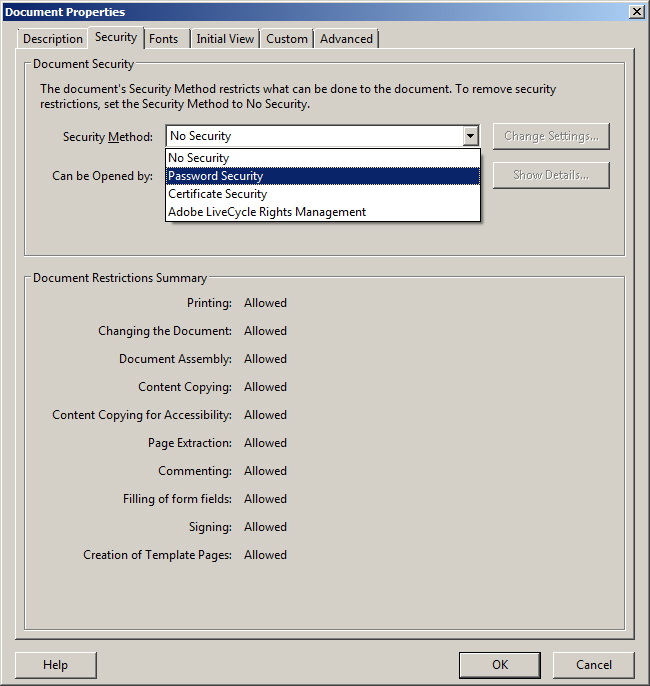 In the Permission section check “Restrict editing and printing of the document. A password will be required in order to change these permission settings.” Choose if you would like to allow printing in the Printing Allowed dropdown. Under the Changes Allowed dropdown select “Commenting, filling in form fields, and signing existing signature fields”. Uncheck the box to “Enable copying of text, images, and other content”. I always keep the box for “Enable text access for screen reader devices for the visually impaired” checked so my file is accessible to those with impairments. Next enter a strong password (mix of uppercase/lowercase, numbers and symbols) in the Change Permissions Password box and click OK. You’ll be prompted with a notification that not all third-party tools may enforce these restrictions, click OK and then re-enter your password to confirm it and click OK.
You’ll receive another prompt that the security settings are not applied until the document is saved. Click OK and OK again to exit the Document Properties dialog. Next, save the file and you’ll see the word SECURED in the Active Title Bar as well as a lock icon in the navigation pane. 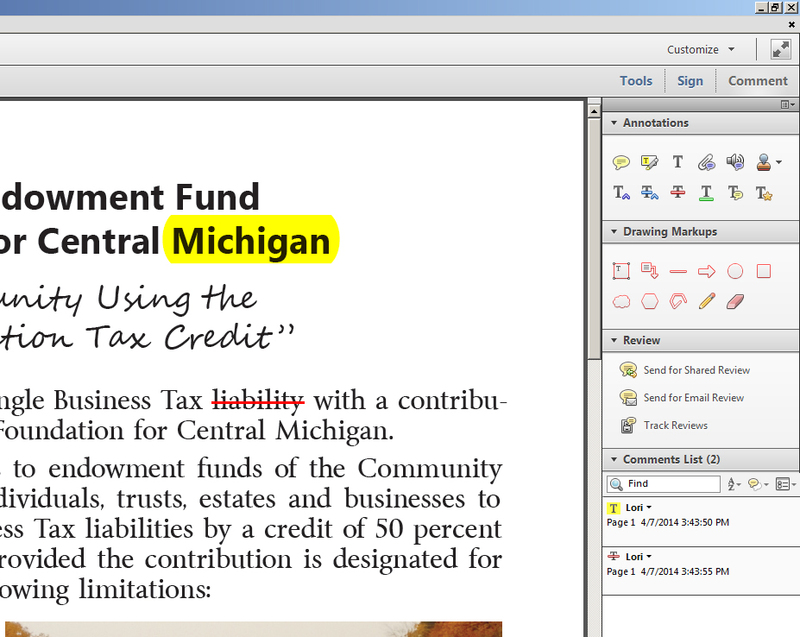 If you open the Annotations or Drawing Markups panel under the Comment pane using either Acrobat or Adobe Reader XI, you’ll notice that it’s possible to add any type of annotation to the file. 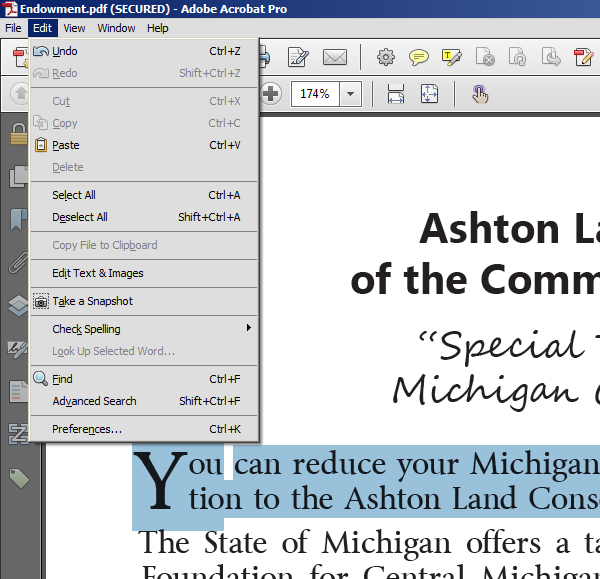 However, if you select some text in the document and then click on the Edit menu, the Copy command is grayed out nor does the copy command appear in the context-sensitive menu. One thing to be aware of when using the commenting tools when a document has been secured like this, is that you cannot automatically copy the selected text into the comment pop-ups. Normally this is a preference you can set under Edit > Preferences > Commenting. 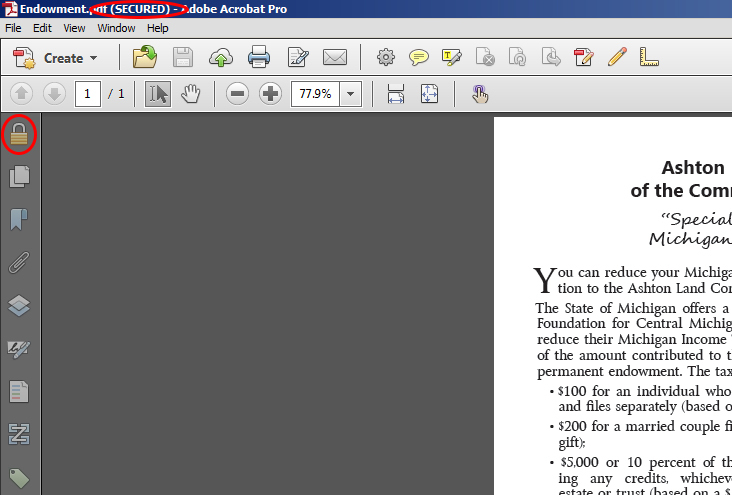 To learn more about security in Acrobat, check out my Adding Security to a PDF File in the Learn Acrobat XI series on Udemy.com.